Accommodation: 252 double rooms, 14 junior suites, 24 suites(bedroom and living room), 2 presidential suites, All seaside, modern furnished, centralized air conditioning/ heating, satellite TV, direct-dial telephone, mini bar, hairdryer, safe. 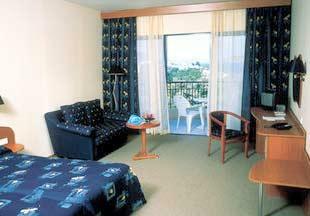 Single guests will receive a twin room for sole use. Facilities Hotel and room facilities of Grifid Arabella Hotel - point the mouse over an image to see the meaning. Facilities: Main restaurant, Bulgarian thematic restaurant, lobby bar, Bar Salon, wellness, mini club, conference room. Sport and wellness facilities: 2 outdoor pools, 1 indoor pool, sauna, hammam, beauty salon, massage; volleyball playground, boccia, shuffle; children and adults animation. Just got back and really didnt want to go. going back for the third time in a row next year! i want, i want to go to Riu, i really want, i want to go to Riu, everybody...! Fabulous holiday, all staff welcoming and friendly. Any minor problems were sorted out quickly and efficiently. Animation team did a great job considering the number of languages they had to contend with. I also liked the idea that the Manager was seen on a regular basis and he made a point of walking round and asking the guests if they had any problems. the anamation team was very relli canny however i was disapointed at the refusal to play the y.m.c.a on my last night.it was rather unfair also how certain guests behaved regarding sun loungers and beach towels. also the indoor pool seems to have alot of chlorine in and this didnt do wonders for my complexion and hair.the pool is broken and has a broken water filter thing in it and it sucked in my leg. it hurt. also the light there is hangin out. very dangerous.the the hotel is very clean and the staff work very hard. lifts are dedly and often shut before you were safley inside.overall i think that the hotel canni but like there cud b sum room for improvment.the decore is very modern definalty the 4 star rating. i enjoyed my stay there and it made my stay in bulgaria very plesent.